Incorporate pattern and texture into sculpture through the use of fiber! 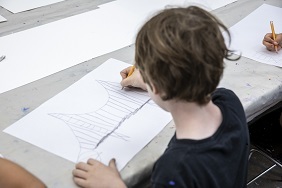 Tweens will learn to bring their ideas and sketches to life, creating anything from plushies to abstract sculptures! While basic sewing may be involved, tweens will also explore other techniques to build their fiber sculptures. Pre-made patterns will be available, but with the guidance of their instructor, teens can also create their own templates for original designs. Explore the world of webcomics! Tweens will learn various techniques for comics, as well as discuss strategies for starting and maintaining a successful project on the web. Students will learn how to improve their artistic skills, touch on ways in which they can safely and effectively use the web to their advantage, and discuss the best ways to manage consistent updates of their work online.